RYA Yachtmaster Certificates are only obtained by independent practical examinations by an RYA Examiner. To take the RYA Yachtmaster exam you need a Marine Radio Operator’s Certificate (SRC or VHF), a current First Aid Certificate and a minimum sea time of 50 days, 5 days as skipper, 2500 miles, 5 passages over 60 miles, including 2 over night and 2 as skipper. Remember, the examination is essentially a test of ability to take charge of a yacht, so your experience as skipper is most important. At least half this mileage and skippered passages must be in tidal water.The mileage requirement is quite high and encourages candidates to sail in a variety of weather conditions to a variety of harbours and anchorages. A Yachtmaster should be able to enter any well-charted harbour with sufficient depth by day or night for the first time. Although it is possible to book an examiner directly through the RYA and take the exam on your own yacht (assuming it is appropriately equipped), most people feel that they need to brush up their skills before attempting the exam. In fact, it is often worth receiving some tuition if only to find out your strengths, weaknesses and go through the type of tasks and questions an examiner could ask you. The RYA therefore recommends that you arrange tuition, the boat and the examiner through a recognised RYA sea school. For exams outside the UK this is the only option. All RYA Yachtmaster candidates must be aged 18 or over to take the exam and qualifying experience should be gained over the age of 15. The YM Coastal exam fee is £181, the YM Offshore exam fee is £210. The examiner will meet you on board the boat. All exams are slightly nerve racking, even for highly experienced or professional skippers. Talking to the examiner and making sure you understand what is required will help you unwind. The examiner understands that the first hour or two is difficult and will emphasize that the idea is to find out what you can achieve, rather than to pick holes or ask trick questions. You will be asked to undertake a short passage, although you may have to plan a longer one. Overseas candidates will be asked to do a significant amount of tidal passage planning to demonstrate their experience in tidal waters. Before your passage, discuss with your examiner what you are being asked to do. In general, you should skipper the yacht in your normal style. If your ambition is to become a RYA Yachtmaster and you need to gain more experience and knowledge before taking the exam, remember that there are courses to help you. 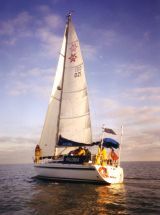 The RYA Yachtmaster Scheme starts with the Competent Crew Course for sailors or the Helmsman’s Course for motor cruising and progresses through Day Skipper to Coastal Skipper. You can enter the scheme at any stage according to your knowledge and experience; there’s no need to start at the beginner’s level.